Today’s National Post had an interesting article with artist Adam Matak. “Over the past few years, this young Toronto artist has made a name for himself by applying a cartoon style to classy gallery settings.” Matak explains that he began drawing at the age of three, and that when he was young he drew in a style inspired by Disney. Later, I trained as a printmaker, so when I started getting into painting I brought in that graphic element, too. And I’ve always been interested in trying to create connections between disparate things. I started off doing Greek busts and combining them with graffiti -trying to meld ancient and contemporary art (The National Post, April 4, 2011). 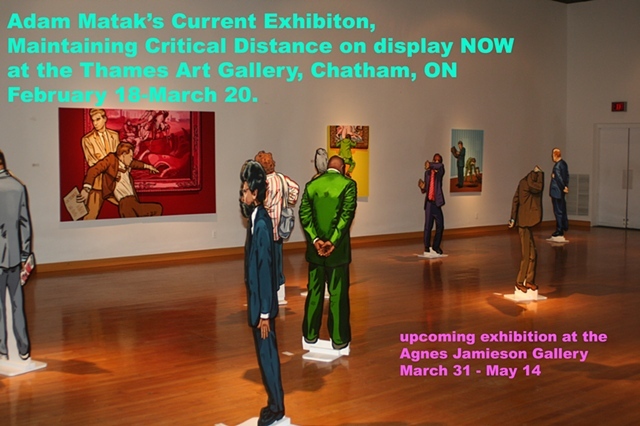 Check out the photo of the Thames Art Gallery space above, with Matak’s cardboard cutout figures, whom he describes as “museum patrons.” Very cool. More examples can be seen on the “Sculptures” tab on Matak’s website. Matak’s “Museum Series” of paintings equally explores the public experience of art, poking fun at how disengaged many viewers may at times appear. But the deeper message concerns what an audience may be missing by not reflecting on the lineage from which art springs, and what we may have to learn from it about ourselves. In a way, the cut-outs are about a loss of that connectivity I described earlier. On each side, the person in the cut-out has their back to you. I think that overall we have a disconnection to things; public participation in any kind of community institution, from recreation centres to churches to museums, is dropping. When we get free time now, we’d rather spend it by ourselves on a computer or watching a movie. The tendency is towards isolation. If we can’t even connect to something really significant -to art history, where I might get my sense of belonging from -then maybe that’s where the educational quality in my works comes in, in trying to connect images of the past and of history to our story today (The National Post, April 4, 2011). He performs that often promised yet rarely accomplished feat of transforming the mundane into the sublime. He conjures up otherworldly alternative realities for the banal objects of our everyday world – figuratively tossing them up into the air, then magically recombining them into new and amusing forms (The Globe and Mail, March 11, 2011). Whatever plot thread you thought you were following is eventually lost. There comes a moment where even the most attentive reader gives up hope of “following along” and simply goes where Katchor points. When you finally close the book, you find your mind has become temporarily altered. You can’t walk through the urban landscape without seeing it through his eyes. The supermarket becomes a place rife with exotic possibilities. A vacant lot suggests some fascinating historical urban struggle. A man delivering free newspapers might very well be a link in a secret chain stretching into the trackless wastes of Siberia or perhaps to the peaks of the high Himalayas (The Globe and Mail, March 11, 2011). These are difficult comics, make no mistake. Sometimes the energy necessary to appreciate Katchor’s surrealist machinations are their own reward, with the occasional page catching you off guard and making you laugh out loud. But if you’re not fully investing your attention in these comics, from my experience they will be glossed over or at least under-appreciated. Don’t miss the “Panel by Panel” link in which a Katchor strip is deconstructed by Seth. 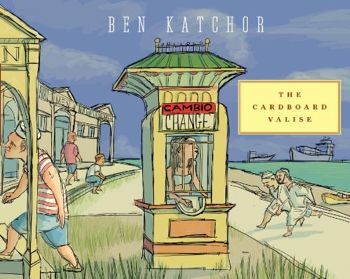 Though I have not read The Cardboard Valise, on the basis of my past reading experience with Katchor, nor am I in any hurry. I can appreciate his genius from a distance, but inaccessibility of Katchor’s work keeps me away. See also Sean T. Collins’ review at The Comics Journal.